Allen Miller is a venture captialist at Matrix Partners. He's excited by bold entrepreneurs building great companies across categories, especially in fintech. All the attention in financial services this year has gone to the newest kids on the block: cryptocurrencies. With bitcoin now eclipsing $15,000 and Coinbase adding more than 300,000 users in one week alone, it’s easy to see why. While cryptocurrencies stole the spotlight, a clutch of companies were quietly working behind the scenes to slowly bring the financial services establishment to its knees. It may turn out that these startup entrants of the last several years will prove to be the more relevant disruptors. Earlier this year the “fintechs” hit a massive milestone, one that very few people noticed but which must certainly be keeping senior execs at banks, credit card companies and other institutions up at night. 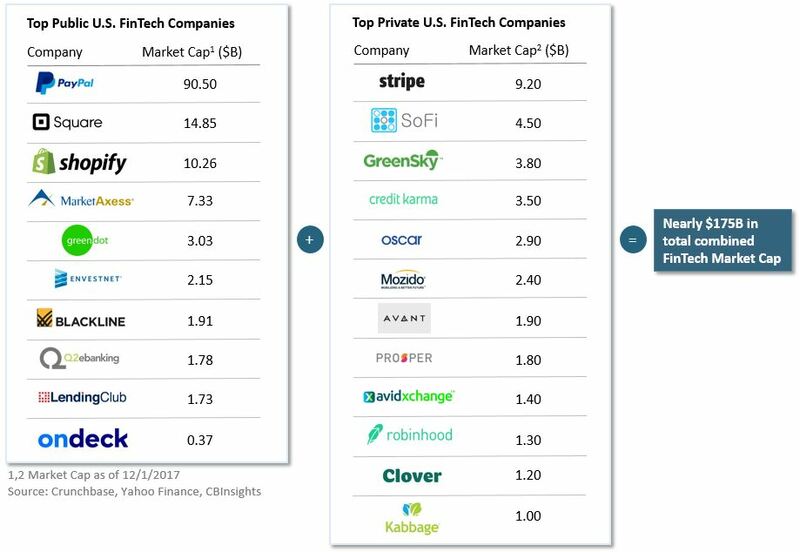 In June of 2017, for the first time in history, the top 10 publicly traded U.S. fintechs surpassed $100 billion in total market capitalization. Now that number is over $130 billion, and there are another dozen privately held fintechs in the U.S. collectively valued at almost $35 billion. Together this is nearly $175 billion of value that didn’t exist 20 years ago. Other recent artifacts that must surely be unsettling for the incumbent financial institutions include: PayPal’s market cap surging past that of Amex and Robinhood quickly closing in on E*Trade in terms of total number of accounts opened — in just three years. With an eye toward tracking the progress of disruption in the financial services space, we’re excited to release the Matrix U.S. FinTech Index. This index is a market-cap weighted index that tracks the progress of a portfolio of the 10 leading public fintech companies listed above over the course of the last year (beginning in December of 2016). For comparison, we also included another portfolio of the 10 largest financial services incumbents (companies like JP Morgan, Visa and American Express), as well as the S&P 500 index. As seen below, the Matrix FinTech Index shows a clear win for the fintechs. To their credit, after a rough year in 2016, the incumbents rallied in 2017 to perform slightly better than the S&P 500 Index — yielding 29 percent returns over the one-year period (compared to the 20 percent returns by the S&P 500 Index). The fintechs, however, have blown by this, delivering 89 percent returns and handily beating the incumbents by 60 percentage points. If you had invested in the Matrix FinTech Index a year ago, you would have almost doubled your money in just one year. Unfortunately for the incumbents, the outlook only worsens from here. The “old-guard” has long been suffering from inflexible back-end systems, antiquated ways of serving customers and human intensive processes. They’re also increasingly at risk of losing trust with consumers as a result of very public failures like the Wells Fargo scandal and the Equifax data breach. 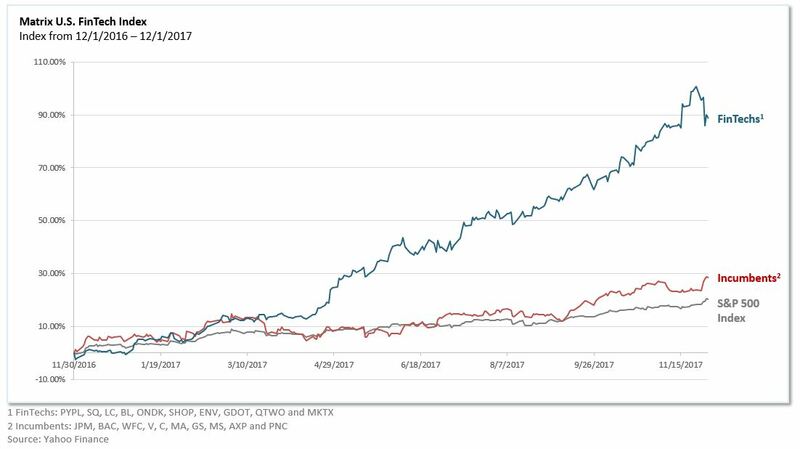 In the next 10 years, we predict that the incumbent’s portfolio returns (shown above in red) will drop well below the S&P 500 as they continue to disappoint end consumers and cede ground to the fintechs. Meanwhile, the fintech takeover has just begun — financial services in recent years has been 7-9 percent of U.S. GDP (i.e. trillions of dollars). In the decade to come, we will see the Matrix FinTech Index continue to climb to new heights as the existing fintechs surge in value and as we add many more fintechs to the Index. In fact, the nearly 100 percent growth we’ve seen in the last year is the bottom end of the hockey-stick, just hitting the inflection point. By 2027, as we accelerate up the hockey stick, every aspect of financial services, from payments to lending to investing, will be dominated by fintechs. Move over financial services — the fintechs are here and they aren’t going anywhere anytime soon.